Detlef Ruddat’s 10-year old Hessian branded stallion Rassolini has been sold to the United States. The liver chestnut stallion has been acquired by a syndicate of 10 owners, which has secured the ride on the horse for U.S. Olympian Jan Ebeling. 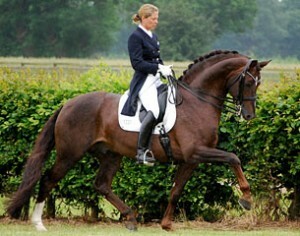 Trained and competed by Kathrin Meyer zu Strohen, Rassolini has been a very successful young horse in Germany. He was initially started by Klarissa-Alexandra Liss, who gave Rassolini’s first claim to fame at the 2006 Bundeschampionate, where the pair finished 8th in the 3-year old stallion division. Meyer zu Strohen took over the ride and in 2008 the pair competed at the 2008 World Young Horse Championships in Verden and the Bundeschampionate Finals in Warendorf. At both Championships they finished fourth. In 2010 they won the Nurnberger Burgpokal Finals for Developing Prix St Georges horses at the 2010 CDI-W Frankfurt. In June 2012, the duo made its national Intermediaire II debut at Isernhagen and won the class with 69.53%. Rassolini has now been acquired by a group of 10 people around investors Ann Romney, Beth Meyer and Amy Ebeling, which own Ebeling’s 2012 Olympic mount Rafalca. The stallion will be Ebeling’s 2016 Rio hopeful. The German born Ebeling is based in Moorpark, California and trains with German Wolfram Wittig. To get acquainted with Rassolini, Ebeling will be riding with Hans Heinrich Meyer zu Strohen for a while.